Make a watery solution of water, green cardamom, and jaggery. Now, mix 4 tbsp of the above solution of jaggery to ghee, and coconut. Mix into the wheat flour and form dough, just as you make for chapattis. Use as much as jaggery syrup as required, to make dough. Now, take a lump of dough, press it flat on your palm, and press it against a sancha (embroidered wooden surface or mould) for making a shape. 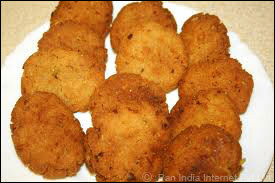 After the shape has been acquired from the sancha, deep fry in ghee or oil till golden brown. Strain the ghee on a paper towel. Take milk in a pot and bring it to a boil. Reduce the flame. Meanwhile wash the raw rice thoroughly. Add the rice into the boiling milk. When rice are half cooked, add little water if required. Mix sugar and cashew nut pieces with cooked rice. Dissolve saffron in little milk. Add it to the cooked mixture with cardamom and raisins. Mix well. 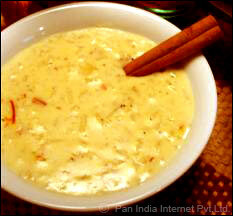 Rice kheer is ready to serve. Mix milk and 1 cup of sugar in a thick-bottomed pan. Cook to reduce it to a fourth of its original volume while stirring frequently. Remove it from the fire; allow cooling and then chilling in the refrigerator. Mix equal quantity of sugar and water in a pan. Boil it until a single-thread consistency is obtained. Add cardamom powder, saffron threads, mix well. Keep it aside to use later. In a large mixing bowl, blend the condensed milk, flour and baking powder together to form a smooth batter. Meanwhile heat enough ghee in a deep frying pan to cook the malpuas. Pour the batter into the oil to form circles about 4" in diameter. Remove from the oil and put directly into the sugar syrup. Remove after 2-3 minutes and drain on a wire rack. 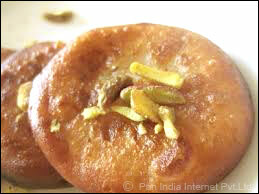 Now to serve, place 2 malpuas in a plate, spoon rabri over them and garnish with slivered nuts. Mix maida, soda, and 2/3 cup ghee to make stiff dough. Roll out small balls from this dough. Heat ghee and fry these balls till it turns brown. Prepare sugar syrup of two thread consistency. Dip fried balls in sugar syrup.